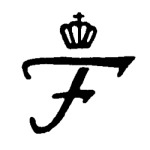 Furstenberg Porcelain Works was started in Furstenberg, Germany, in 1747. It is still working. Vases by Furstenberg are popular with collectors. So are tableware and figurines. Many of the modern products are made in the old molds.